With a population growing nearly 50% since 2002, Asian-Americans are the fastest growing multicultural segment in the U.S. At 20.5 million strong, Asian-American consumers not only exert an $825 million buying power, but a powerful influence over mainstream culture as well. This audience, however, differentiates itself from all other ethnic groups with a myriad of cultural nuances from language, interests, lifestyle and values. Asian-Americans descend from over 40 countries, speaking several languages and dialects from Korean, Hindi, Mandarin, Japanese, Vietnamese and more. 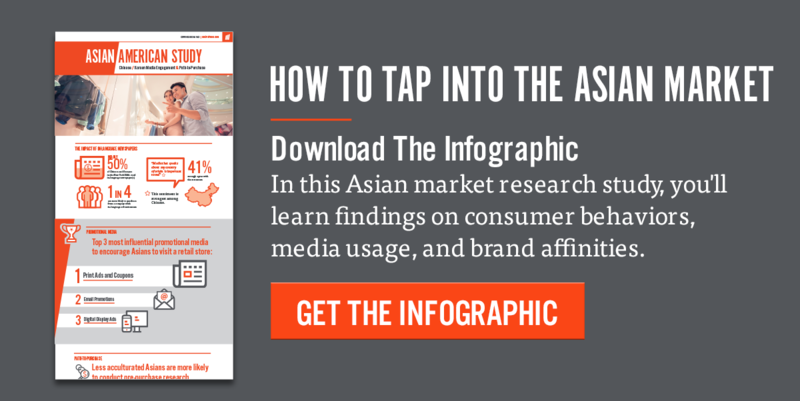 Although many Asian-American consumers speak English outside the home, they consume in-language media, consequently making multilingual marketing efforts one of the best practices. The top five Asian DMAs include Los Angeles, New York, San Francisco, Washington, D.C., and Chicago, however, keep in mind that you may need to conduct thorough market research to determine which areas possess the larger share of your subculture of interest prior to executing your marketing campaign. The Asian-American segment is ahead of the curve when it comes to tech adoption. These consumers over-index in the possession of all three major Internet personal devices: smartphones, computers and tablets to stay connected with their family, friends, culture and latest news. Furthermore, reflecting a culturally-ingrained mindset of resilience and self-reliance, Asian-Americans are natural-born entrepreneurs and key drivers of new business growth in terms of employment and sales across a variety of industries nationwide. Current data shows almost 40% of Asian-American women are entrepreneurs. Almost 70% of Asian-Americans agree that cultural heritage is important to them. As family and community are integral to the Asian-American household, incorporating these ideals in your brand’s messaging is a powerful method to appeal to these consumers. Moreover, packaging and values are key drivers for Asian-Americans in purchase decisions. Content that encourages education, health and wellness are further effective in reaching this segment. Nearly 50% of Asian-Americans have a college degree compared to 28% of the general population, and are 31% more likely to buy organic foods.